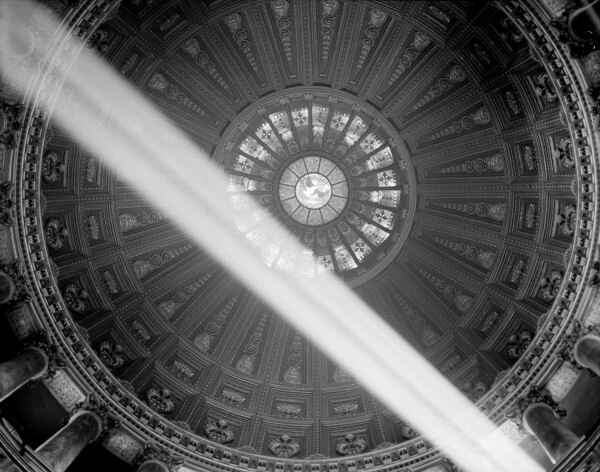 The above images of sunlight pouring into the Capitol dome are from the 1950's. Photos by Eddie Winfred "Doc" Helm, courtesy Illinois State Archives. To the left is a photo taken in 1887 or earlier, as there are no statues on the corbels. The statues were erected on the corbels beginning in August 1887. The same view today is shown on the right. Click here to view The Corbel Statues. 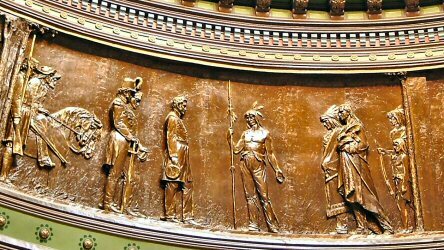 This photograph shows the impressive centerpiece of the Statehouse. The stained glass is to be found at the summit of the inner dome. Notice the arcane spelling of the word sovereignty. 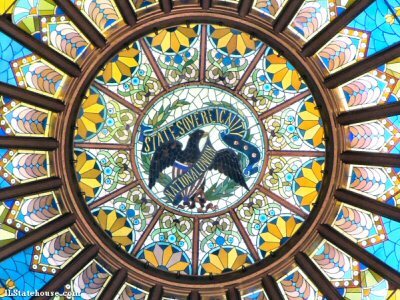 Also, the phrase “State Sovereignity” is placed above “National Union.” This is opposite of what appears on the “official” Great Seal of Illinois. The placement of the phrases was the topic of significant debate during the adoption of the seal in the 19th century. 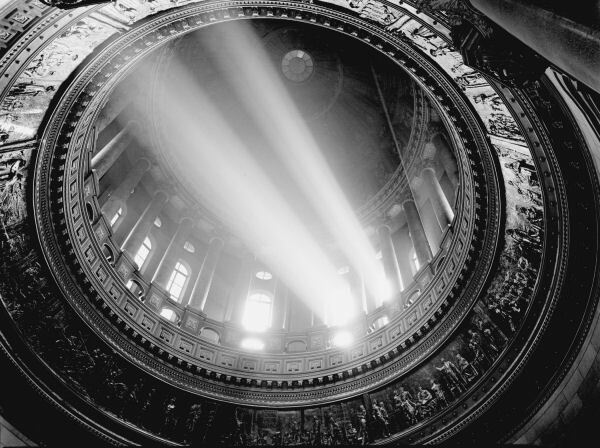 These are photographs, in no specific order, of the plaster frieze encircling the dome above the corbel statues. 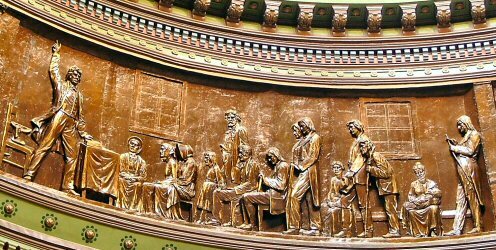 The frieze, which is considered by many to be some of the best artwork in the capitol, is painted to resemble bronze. There is some doubt as to the chronological order of the panels and the events depicted in the scenes. The description below is from the 1900 edition of the Illinois Blue Book. 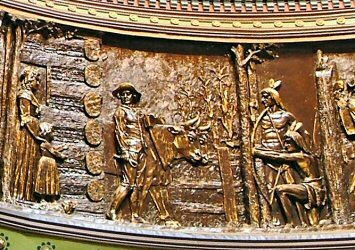 "At the base of the inner dome, is a series of allegorical and historical pictures, in bas relief, of conceded artistic merit. Among these are the discussion of the stamp act, in the Virginia House of Burgesses, with Patrick Henry as the central figure, making his memorable address, and Washington and Richard Henry Lee among his attentive auditors; the evacuation of Yorktown by the British forces; Peter Cartwright, the pioneer preacher, conducting a religious service in a “settler’s” cabin; the surrender of Black Hawk at Prairie du Chien; and a joint debate between those giants of the political forum, Abraham Lincoln and Steven A. Douglas, in their great campaign of 1858. In these historical representatives all of the figures are supposed to be portraits of historical characters. Many of them are easily recognized, but others it seems impossible to identify, as the gifted artist, T. Nicolai, who designed and executed the work, dying before it was wholly completed, left no key to the different groups so graphically represented." 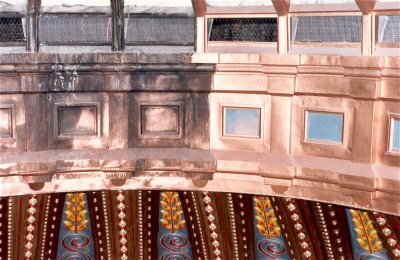 The inner dome was cleaned and repainted in 1986. At that time the stained glass at the top was also cleaned and refurbished. 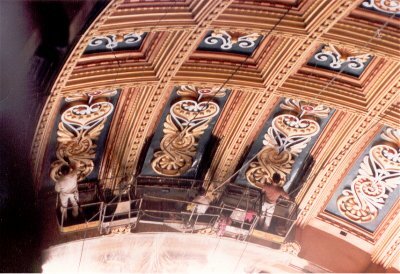 In this photo the inner dome is being painted by workers in a basket suspended from the top of the dome and pulled to the sides by cables. 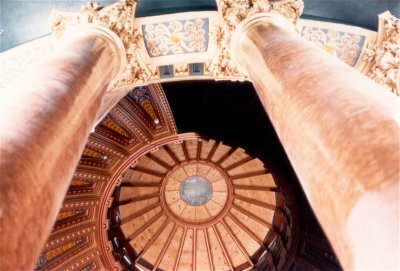 This is a photo taken at the top of the inner dome just below the stained glass, taken while the restoration was in progress. This is a view of the dome with the stained glass removed for cleaning and repair. The years of dirt, smoke and neglect are quite evident on the right side of this picture, when compared with the freshly painted side. 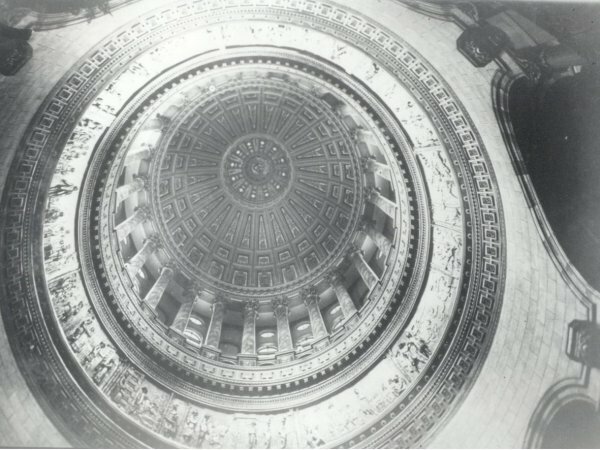 The above photographs illustrate the dramatic transition after the late 1980s renovation of the dome.